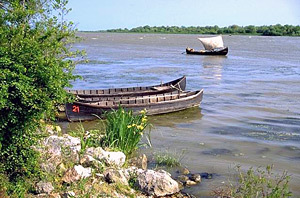 Boats in the Danube Delta.. 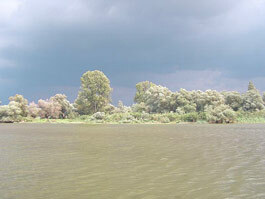 The Danube, the only river on Earth that passes through 10 countries (Germany, Austria, Slovakia, Hungary, Croatia, Serbia, Romania, Bulgaria, the Republic of Moldova, Ukraine) and four capitals (Vienna, Bratislava, Budapest, Belgrade) flows into the Black Sea via a delta which covers, together with Razelm – Sinoe lagoon complex, about 5050 square kilometers, of which 732 square kilometers are in Ukraine. More precisely, it has the following coordinates: 28° 10’ 50” East (Cotul Pisicii) and 29° 42’ 45” East (Sulina); 45° 27’ North (Chilia Branch, km. 43) and 44° 20’ North (Midia Cape). 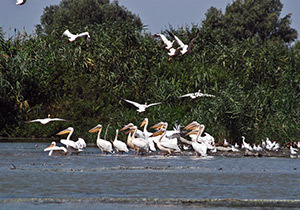 In 1991, it became part of the UNESCO patrimony, being the only delta in the world that is declared a Biosphere Reserve. 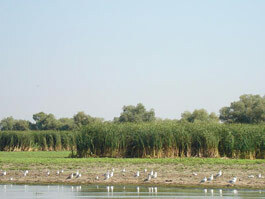 Sulina Branch – Danube Delta. 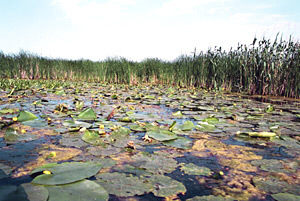 Sfantul Gheorghe (Saint George) Branch is 112 km long, is south-east oriented, carries 22% of the Danube’s flow and when flowing into the Black Sea, it forms the Sacalin Islands, considered to be the beginning of a secondary delta. 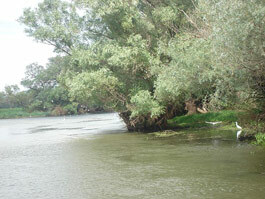 On its banks there are the villages of Nufaru, Mahmudia, Uzlina and Sf. Gheorghe. 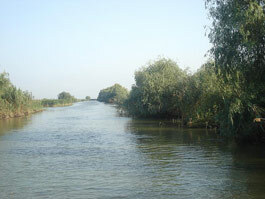 Other sources state that Chilia Branch is 120 km length, Sulina Branch – 64 km and Sfantul Gheorghe (Saint George) Branch – 108 km. A series of customs, different from one village to another, are prepared for the older ones who have a baby. In Murghiol, for instance, the parents must jump over a fire set in their yard, meaning that they left the misfortunes behind. In Baltenii de Sus or Mahmudia the parents are toppled over the boat, because the water must wash their bad thoughts. The rich ones can redeem this “watering” with a treat at the village tavern for all who pass by. In C.A. Rosetti and Caraorman, people put horse skulls at their gates to protect themselves from curs and witchcrafts, believing that the possible misfortunes will fall down over these skulls. The Lippovans do not allow anyone to whistle in their boat, because that brings them bad luck. 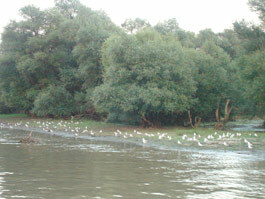 Local fishermen usually use fire water or vodka as trade coins here. 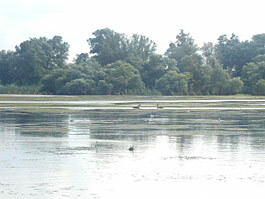 The institutions that coordinate the economic and touristic activities from this area are in Tulcea, although the town is not situated in the Delta. You can also find here some interesting museums, like the History and Archaeology Museum, the Ethnography and Folk Art Museum, the Art Museum or Natural Sciences Museum. 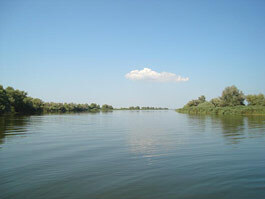 When a tourist arrives in Tulcea, he /she has a lot of options for a trip into the heart of the Delta. The best way to arrive there is by motorboat (30 euro per person). 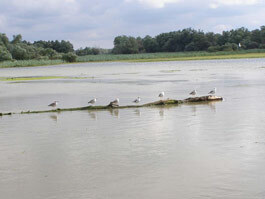 The fast trains await their clients on the cliff from Tulcea. 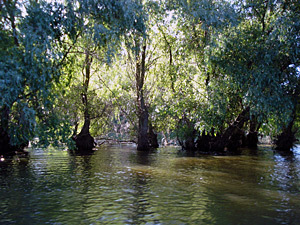 A very important spot is the channel called “Cu barca prin padure”, which is in fact a whirlpool that dug its way through a willow forest. The tourist has the impression that he travels though a sinking forest. 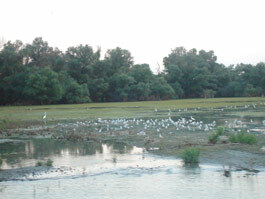 The ones who want to visit the ”Purcelu” bird colony, they have to pay extra 10 euro. 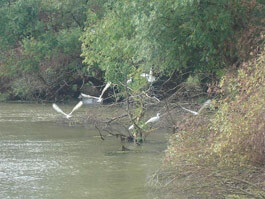 They can see egrets, herons etc. 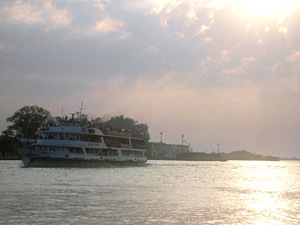 The tourists that want a several – days perjury, they can travel by the passenger ship from Tulcea on the arms of the Danube. 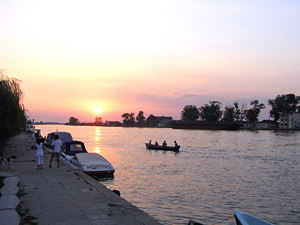 Every town that you get in the way is full of pensions that offer, besides accommodation, trips on the channels, traditional fish dishes and fishing contests, according to the tourists’ skills (the prices demanded by the pensions are no higher than 50 lei for the night). Sulina, Sf. 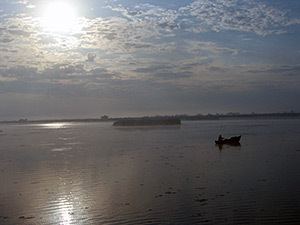 Gheorghe and Jurilocva-Gura Portitei are options for the tourists that are in love with the sea and want to discover the beauties of the Delta. Paying 100-400 lei for each night, the tourist can get accommodation in hotels, pensions or villas. 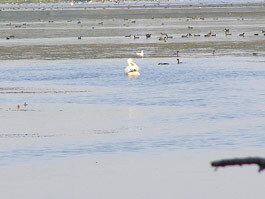 They have the pure beaches of the Romanian sea-side at their disposal, but also they can go to the Delta for specific activities. 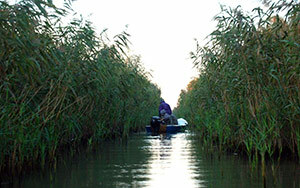 The best way to arrive into the Danube Delta is by personal car, other possibilities would be less practical. 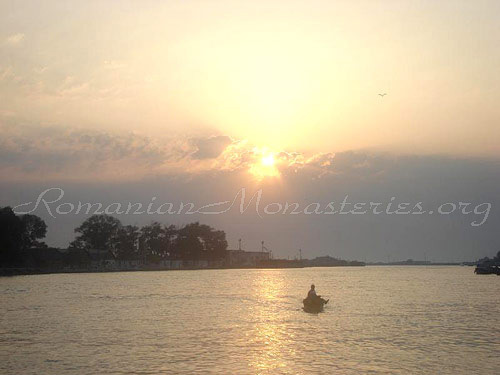 There are also maxi-taxis in Bucharest, Galati and Constanta that travel to Danube Delta every hour; there are trains that travel from Bucharest and Constanta to Tulcea, but they are way too slow. 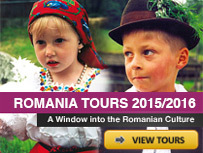 TAROM agency facilitates a weekly flight to Tulcea. 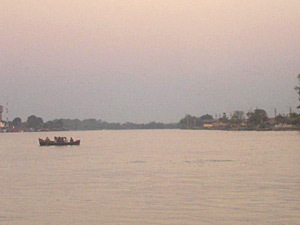 He can help you with accomodation also and you can negotiate the price of the vacation in Delta. my name tom i am looking to come and live in romania can anyone help me, i was adopted from suceava so i am romanian but be living in england for last 18 years, but so hoping i can come back to romania its lovley country and the people our amzing.. 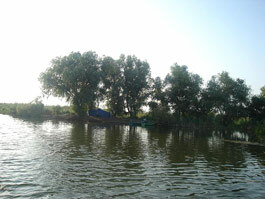 I come from the Danube Delta and I have friends that have small boats and can take you around the delta. 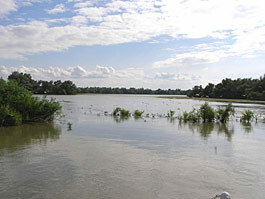 They are in Tulcea which is the biggest town in that county and entrance to the delta. 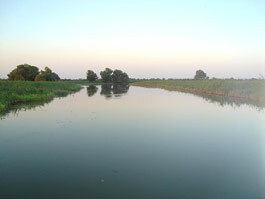 By car you can’t get inside the delta, there are too many canals. 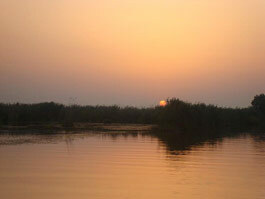 Murighiol is one of the few towns where you can get by car(modern road) and you’re in the delta. 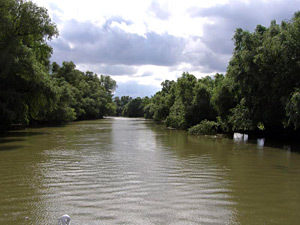 I recommend the town of Sfantul Gheorghe, so travel on the canal with the same name. Nadezda hasn’t been there since the ’80s, now there are a bunch of hotels, motels and every one of them have motor boats for their customers. The nonpopulated areas are the beauty of this place, so serene and gorgeous. If you need more help let me know at madromanian2@yahoo.com . You don’t need to bring your own toilet paper. 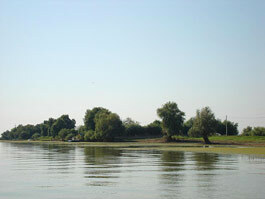 In Tulcea river station you can learn about other possibilites to go in Delta. you are also a dreamer if you think Bulgaria is more beautiful than Romania. Don’t forget to drink the milk before going to sleep. Sleep tight! Thank you for this colorful and very informative web page. 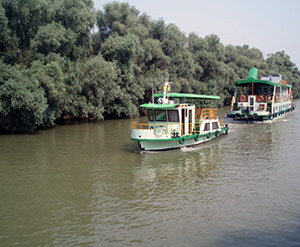 I am interested to plan a journey down the Danube, using ‘daytime excursion (intercity) boats, not big cruise ships. 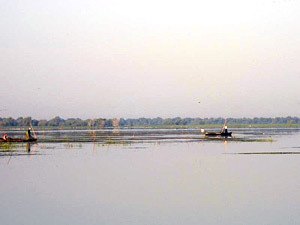 Can you inform me about such boats in the Delta region? And in Romania generally? If practical, I might want to continue on to Istanbul via a similar service on the Black Sea.